The Athlete And The Gladiator : 13.7: Cosmos And Culture Commentator Alva Noë argues that athletes probably don't think of doping as cheating, whatever they or anyone else says. They are just doing what it takes to win because there is nothing to be gained from losing. 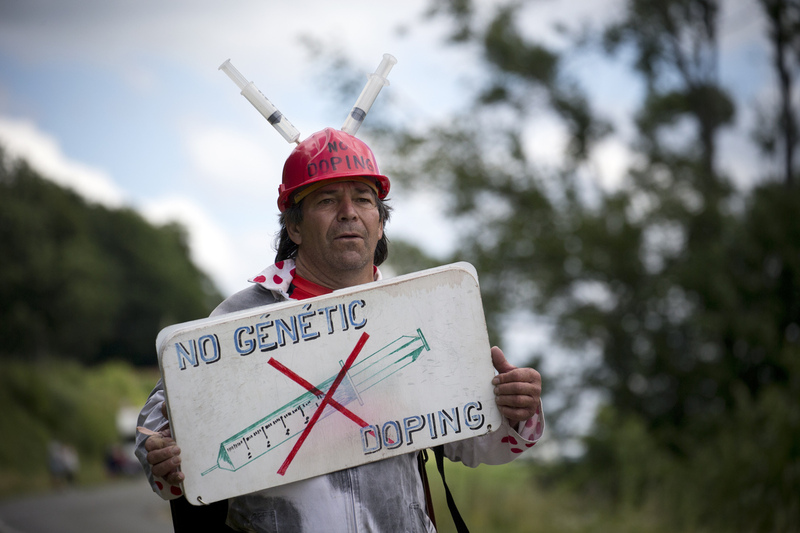 An protester shares his anti-doping message during the 2012 Tour de France. If there is value in spectator sports, it surely has something to do with the opportunities they provide for teaching us about human striving, doing, the surmounting of obstacles and the very many different ways there are of failing to make it over. Sometimes we are beaten; and sometimes we beat ourselves; luck is often the decider. And sometimes we make our own fate. During the Olympics all this is writ large, so for the next few weeks, here at 13.7, I'll be writing about sports and human action. To begin with, I'd like to raise a question I've posed before. Why are we so offended by the use of performance enhancing drugs in sports? I take it for granted that we are. The short answer, obviously, is that we view someone who dopes to improve athletic performance as a cheater. Why? It is not merely because they violate the rules or the law. No, it would be cheating to take drugs, I think we are inclined to believe, even when the molecules in question aren't banned. It was cheating before anything was banned. Why? Our thinking is vague here. I suspect it goes like this: doping improves performance in ways that athletes can't take credit for. The results improve, but the performance of the athletes does not. Not really. They merely fake it, making it appear is if they can accomplish what in fact they cannot. Now just why we should think this is true of the use of performance enhancing drugs is an interesting question. I'll return to it next week. Today I want to discuss a different piece of the puzzle of making sense of our attitudes about performance enhancing drugs. A recent study by Dodge et al. shows that, while we probably view the athlete who dopes to win as a cheater, we are less likely to to condemn as a cheat a student who dopes to improve academic performance. Why should this be? If, as I suggested above, we reject the use of drugs in sports because they destroy agency, diminishing responsibility (praiseworthiness or blameworthiness) for the things we do, then this ought to apply to domains outside of sports. If a boy's success in the math class depends on his taking a med, then shouldn't we say that it isn't really his success at all? We need to look for what differentiates these cases elsewhere. Here's a proposal: academic study aims at knowledge, and knowledge, we are inclined to think, is a good in itself. If you can solve differential equations, or read books in foreign languages, then that's good, and it doesn't really matter how you got there. In effect, you can't really cheat at learning. Short cuts are just, well, short cuts! But not so with sports. With sports ends and means collapse into each other; method and result are one. It's not crossing the finishing line first that counts; it's winning. But you only win if you play by the rules. In sports the goal is only valuable in the context of the game. It isn't just that the cheater doesn't legitimately win. The cheater does not even legitimately play. But there's a fly in the ointment. The suggestion that the goals in sports — faster, higher, stronger, etc. — are only valuable in the context of the fair play of the game is untenable. Winning has rewards that are definite and entirely extrinsic to fair play. We shower winners with love, glory, celebrity, not to mention million-dollar endorsements. We wouldn't blame a gladiator for juicing. After all, what's at stake in the ring is survival and the value of survival is absolute. But we look the other way when it comes to the gladitorial reality of our present day sports industry. What good is fair play to the losers, to the ones who don't bring home medals? To those whose careers end in injury? To the ones who never show up on the Wheaties box, or on morning television? Their losses are real and are not confined to the playing field. It's hard to get athletes to speak frankly about this, but I suspect that this is really how they, as a community, see things. This would certainly explain the fact that the history of sports over the last 30 years or so makes it pretty clear that athletes cheat. They will cheat when they can get away with it; they'll find new ways to cheat when they no longer can. They cheat because everything they know and hope to achieve depends on victory and there is literally nothing to gain from losing. They cheat because, if I am right, they don't experience themselves as cheating after all. Like the gladiator, or the scholar, they are simply doing what they need to do to thrive.